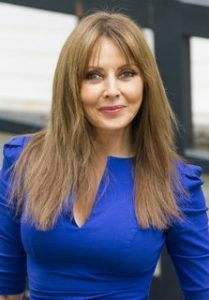 Carol Vorderman is an English television personality, best known for co-hosting the Channel 4 daytime puzzle show Countdown. She was a host of ITV’s Loose Women from 2011 until 2014. She hosted a series about cooking on ITV called Food Glorious Food in 2013. In 2016, she competed in the sixteenth series of I’m a Celebrity…Get Me Out of Here!, where she finished in eighth place. She has written books about detox diets. Her No. 1 bestseller was Detox For Life, which sold over a million copies. Born Carol Jean Vorderman on December 24, 1960 in Bedford, Bedfordshire, England, to Anton ‘Tony’ Vorderman and Edwina J. Davies, she was raised in her mother’s hometown of Prestatyn, north Wales. She is of Dutch descent on her father’s side, and of Welsh descent on her mother’s side. She was educated at the comprehensive Blessed Edward Jones Catholic High School in Rhyl, and studied engineering at Cambridge University; graduated in 1981. She began her career in 1982, joining Channel 4 game show Countdown. Vorderman was married to Christopher Mather from 1985 to 1986 and Patrick King from 1990 to 2000. She has two children: Katie and Cameron King. *She was born on December 24, 1960 in Bedford, Bedfordshire, England, UK. *She is the youngest of three children. *Her parents separated when she was three weeks old. *She studied engineering at Sidney Sussex College, University of Cambridge. *She co-hosted the game show Countdown for 26 years from 1982 to 2008. *She was a contestant in the second series of Strictly Come Dancing in 2004. *She was awarded the Member of the Order of the British Empire (MBE) in the 2000 Queen’s Birthday Honours List for her services to broadcasting.